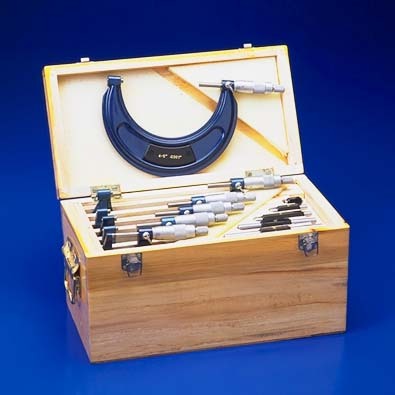 All micrometers come standard with carbide tips, ratchet stops and locking lever. 5” and larger sizes have lightweight frames for greater ease in handling. Meets or exceeds U.S. federal standards. Hardened & ground spindle threads. Sets provided in a wood case. Available in individual sizes from 0-1” – 11-12”, and sets 0-3”, 0-4”, 0-6”, 6-12”, and 0-12”.